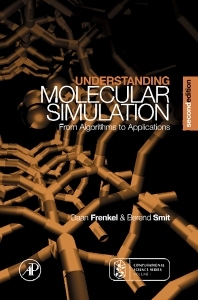 Understanding Molecular Simulation: From Algorithms to Applications explains the physics behind the "recipes" of molecular simulation for materials science. Computer simulators are continuously confronted with questions concerning the choice of a particular technique for a given application. A wide variety of tools exist, so the choice of technique requires a good understanding of the basic principles. More importantly, such understanding may greatly improve the efficiency of a simulation program. The implementation of simulation methods is illustrated in pseudocodes and their practical use in the case studies used in the text. Examples are included that highlight current applications and the codes of case studies are available on the World Wide Web. Several new examples have been added since the first edition to illustrate recent applications. Questions are included in this new edition. No prior knowledge of computer simulation is assumed. Daan Frenkel is based at the FOM Institute for Atomic and Molecular Physics and at the Department of Chemistry, University of Amsterdam. His research has three central themes: prediction of phase behavior of complex liquids, modeling the (hydro) dynamics of colloids and microporous structures, and predicting the rate of activated processes. He was awarded the prestigious Spinoza Prize from the Dutch Research Council in 2000. This book is a reference for everyone willing to master the theory of molecular dynamic simulations. The clear and detailed presentation of diverse simulation algorithms helps understanding the underlying theoretical concepts.